If you're looking for a free TOEFL practice test, then click the button below to start a 1 hour free TOEFL sample test. Below you'll find links to online TOEFL tests and TOEFL exam simulators. Do I need an account to use your free TOEFL sample test? Although creating a free account is not required to take a free TOEFL simulation, in order to view your results and track your progress, you'll need a free account. The remainder of this guide will focus on how taking TOEFL sample tests online will significantly help you achieve your target score and ultimately be accepted into the program you have or will be enrolling into. We'll also look at some of the best TOEFL test online resources outside BestMyTest including official TOEFL exam simulators, free PDF downloads, TOEFL books, and other online TOEFL preparation websites. When and how many TOEFL practice tests you should take? 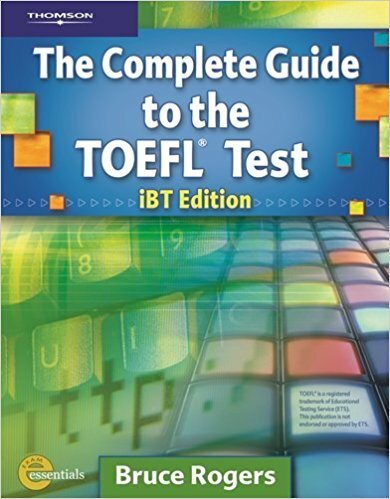 The TOEFL iBT test is a computer based test. It confirms that a student has the English language skills necessary to succeed in an academic setting. That’s why it is the most highly regarded and widely accepted test in the world. More than 8,500 colleges, universities, and agencies in 130 countries accept TOEFL scores, so test takers have the flexibility to use their TOEFL test scores worldwide. The TOEFL iBT test has four sections: reading, listening, speaking, and writing. Here is a breakdown of each section. Let's have a brief look at each TOEFL section. We'll go over what each section includes and where you can find additional resources for each section. 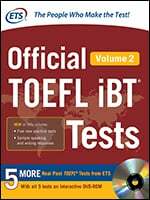 The reading section is the first section of the TOEFL iBT test. It tests your ability to read and answer questions about passages. It contain 3-4 passages, and each passage is followed by 12-14 questions for a total of 36-56 questions. Each passage is generally from 600 to 700 words long. You have 60-80 minutes in which to finish this section. What's different about the reading test compared to the other TOEFL test sections is you can skip answers and come back to them later. Once you get to the end of the reading questions, go back and review your answers, but if you're unsure stick with your first choice, it's more than often correct. In addition to our free online reading TOEFL test questions, you can also prepare for your reading test on the go without an internet connection by using our free TOEFL reading practice test PDF download. It includes a complete reading passage with questions and answers. There are a total of 34-51 questions in the TOEFL exam listening section with about 17 questions in each listening task. You will have 10 minutes in which to complete these 17 questions in each task. This does not include the time you spend on listening to the lectures or the conversation. The entire listening section (including time spent listening) will take you between 60 - 90 minutes to complete. On the listening test, once you submit your answer, you CANNOT go back to it like you can on the reading test, so you may need to guess an answer if you get stuck. You cannot afford to spend too much time on one question as you may run out of time and potentially miss easy questions, so if you do get stuck, unfortunately, you have to move on. Preparing with TOEFL practice tests will definitely help improve your listening test skills to the point where, if you do need to make a guess, you'll be making fairly accurate educated guess based on our complete TOEFL listening lessons. The speaking section is the third section you'll face in the TOEFL iBT test and it takes about 20 minutes to complete. There are a total of six speaking tasks: two independent speaking questions and four integrated speaking questions. Let's have a look at the table below for details about each task. Independent Speaking Question 1 You are asked a general question about your life. Independent Speaking Question 2 You are asked to choose between two options and explain your preference or state your opinion on a topic. Integrated Speaking Question 3 You read a campus announcement or a student letter and then hear two students discussing their opinions on the written notice. You then state one student’s opinion and explain the reasons he or she gives for having that opinion. Integrated Speaking Question 4 You read a passage from a textbook or an academic article about a general concept. Next you hear a lecture about a specific example of this concept. You then summarize the reading and lecture and discuss the relationship between the two. Integrated Speaking Question 5 You hear two students discussing a problem that one of them has and two possible solutions to this problem. You then summarize the problems and explain which of the two solutions you prefer. Integrated Speaking Question 6 You hear a lecture. You then summarize the main points of the lecture. The writing section is the fourth section of the TOEFL iBT test and takes about 50 minutes to complete. Have a look at the table below for details about each task. Integrated Writing Task you are given 3 minutes to read an academic passage. After reading the passage, you then listen to a lecture on the same topic. You then write an essay summarizing the lecture and the reading passage and showing the relationship between them. You should not express your own opinion of the issues and you should not bring in any information form outside the passage and the lecture. Independent Writing Task You read a prompt (a topic) and express your opinions in your response. Your response is based entirely on your own knowledge and experience. When you complete your TOEFL test, your writing must be evaluated. This is done by a combination of human readers and a computer program called e-rater®. Each of your essays is given a score from 0 to 5. Your combined essay scores are converted to a section score of 0 to 30. How well you address the topic. How well you develop and support your ideas. How well you organize the essay and connect your ideas. How well you use the English language, including grammar, vocabulary, and writing conventions. Writing conventions are the special rules of writing in English, including spelling, punctuation, and capitalization. How well you relate the lecture points to the reading points. A great technique to improving your writing skills is to compare your essay with high-scoring essays to see how they're structured and answered the same question. Your goal should be to model these sample essays, but that is easier said then done. Are you ready to learn how TOEFL practice tests are helping our students pass TOEFL? First it's important to understand the 2 biggest problems students face when their trying to prepare for the TOEFL. You study for the TOEFL test using free resources online, but you're not seeing much progress. Your test date is coming up soon, but you don't feel confident you'll get the score you need. If you relate to one or both of these problems, you're not alone. Many students struggle to overcome these issues, but the good news is they're not difficult to solve, and we're going to show you exactly how simple it is right now. Take a TOEFL practice test to learn where you struggle most. Make sure you get the speaking & writing sections reviewed; The only way to improve your speaking & writing scores is to get detailed feedback on your mistakes. Go through our TOEFL LESSONS and learn the necessary skills, tips, and strategies needed to improve where you struggle. We have over 100 TOEFL lessons from basic core lessons to advanced lessons teaching specific skills for specific issues. Practice your newly learned skills. Finally, you'll hone your new skills with over 1500 TOEFL practice questions, 2000 TOEFL vocabulary flash cards and interactive exercises, and even more TOEFL practice tests. Why taking a TOEFL practice test is so important to achieve your target scores. So why is it important to take a TOEFL practice test BEFORE taking the TOEFL iBT? There are 4 major reasons why it's important, so let's look at each one now. The TOEFL iBT and a TOEFL practice test will test you on the same four sections: reading, listening, speaking, and writing, both in that exact order. Therefore, taking a practice test, at least a practice test from BestMyTest, is like taking an official exam. This experience will help you feel comfortable and relaxed during your actual exam. Stress is the biggest reason why test takers with a high English level do not achieve their target scores. By going into TOEFL unprepared, you're more likely to feel stressed out from small mistakes that test takers with more experience learned to ignore. That's just one example, but many others exist, so you want to improve your odds by practicing as much as you can. The TOEFL iBT test is long...very long...about 4.5 hours long, in fact, and you only get one 10-minute break before starting the speaking section. Therefore, along with familiarizing yourself with TOEFL, taking timed, full-length TOEFL practice tests will help you prepare your body and mind to sit through the entire TOEFL exam. Think of it like preparing for a marathon. You cannot show up and run 10 miles unprepared; it takes consistency and dedication to train your body and mind to run the whole marathon. Of course, it's not exactly like a marathon, but you get the idea. By about the 3 hour mark, if you are not utilizing our tips and strategies from how to score high in TOEFL, you may run out of energy. Our TOEFL lessons will help teach you when and where you should focus your energy, so you are not wasting it on things that don't matter. It's not easy finding English study material similar to the official TOEFL exam. The quality of questions you practice matters, and it matters a lot. If you practice easy questions, you're going to do poorly on the reading and speaking section, especially. Now, If you're interested, you might be able to find good reading passages from national geographic, academic essays from certain school websites, and good speeches from TED videos, but none of them come close, in terms of length and format, compared to what you'll experience from the official TOEFL test. Because of this, you should not solely rely on them for your TOEFL preparation. Last, but certainly not least, it's a great way to identify your strengths and weaknesses. As we've mentioned, there are four sections: reading, listening, speaking, and writing, and even though your reading scores might be excellent, you could struggle with the speaking section. In this case, the speaking section would be considered your weakness and could be the reason you fail to achieve your target TOEFL score. By taking a TOEFL practice test, you'll be able to diagnose and improve your weakness or weaknesses and significantly improve your chances of scoring high in TOEFL. What makes a TOEFL practice test great? Questions including passages and audio lectures are close to the official TOEFL in terms of difficulty, length, and style. The format and structure are identical to the official TOEFL test. In summary, a good TOEFL practice test can give you the most authentic test experience possible and offer you add-on tips, teaching, and answers to help you improve and learn better. When and how many TOEFL practice tests should I take? The simple answer is as many as you can. However, that isn't always an option, so from our experience, you should take a TOEFL practice test before creating your TOEFL study plan. This is to help you gauge where you're at. Next, you'll need to figure out how much time you have before your test date and how many practice tests you have available to you. Typically, students need to have 3 - 6 months to prepare for the TOEFL. Some students might need even longer. If you have more than 3 months to study for the TOEFL, you can arrange taking at least 6 practice tests during your TOEFL prep. If you have less than 3 months, we still recommend you take at least 4 practice tests. Here is a recommended breakdown of how many practice tests should be taken according to different TOEFL preparation time-frames. Besides our TOEFL practice tests, you can also find practice tests from ETS: TPO (TOEFL Practice Online) tests, the official guide to the TOEFL, and Official TOEFL iBT Test (Volumes 1 & 2). 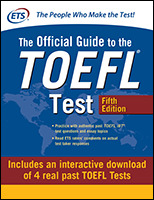 The TPO tests were previously official TOEFL tests that are no longer in use. There are around 40 of them, numbered TPO1, TPO2, etc., and every year four of them are available on ETS' website. However, please be aware of these two critical facts. Each TPO test costs $45 USD for a total of $180 for all four tests. Seems OK until you read the next fact. You can only take the test once per purchase. After finishing a test, you'll have to repurchase another test even if all you wanted to do was study what you got wrong. I'm sure many of you already know about this book. It contains 3 full TOEFL practice tests and a CD rom. What many students find difficult about using books is it lacks skill-building materials and cannot be used interactively online. 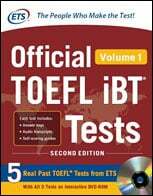 Both Official TOEFL iBT® Tests Volume 1 and 2 includes 5 authentic, full-length TOEFL® tests with answer keys, sample speaking and writing responses, and audio scripts. Volume 2 questions are more similar in content to the current TOEFL test. There are many unofficial TOEFL books out there, so it can be hard to determine which one is the best for preparing for the TOEFL. Don't worry! We've put together a list of TOEFL book reviews: the top 3 most popular books for TOEFL preparation. Each TOEFL book comes with practice tests, so what are the differences between them? Let's have a look at the advantages and disadvantages for each book. There are 7 full-length TOEFL practice tests. Four of these tests are available both in paper and online (as tests 1-4), and three are available only online (tests 5-7). In terms of quality, most practice tests are close to the real online TOEFL test. Some questions might be more difficult compared to the actual test. Another great thing about this book is it teaches a lot of useful TOEFL skills and provides many skill-building materials. In the "Building Supporting Skills" section, there are a lot of test-prep strategies like studying vocabulary or building a study plan. All skills are arranged in logical steps so you learn the basics before moving on to the harder concepts. In later sections, you learn specific strategies for approaching different kinds of TOEFL tasks and questions. For example, the Writing section teaches you how to write a thesis statement in the TOEFL Introductory paragraph. The biggest problem with this book is that if you buy just the book, you won't have access to any of the audio files for all skill-building exercises. You'll still get the audio files for the TOEFL listening practice tests, as well as any speaking or writing portions that uses audio clips). 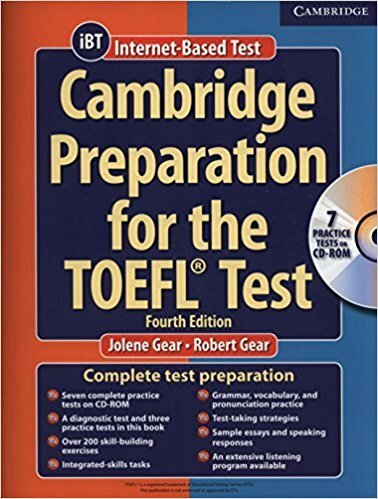 If you really want the Cambridge TOEFL book and its audio CD set, it's best to buy them together as a set. You can get the book and CDs together on Amazon for around $85 USD. 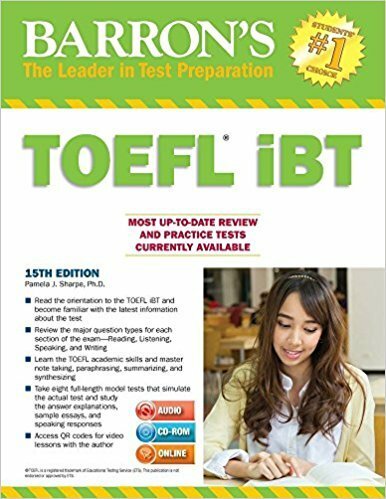 Although this book only offers 2 full-length complete TOEFL practice tests (at the end of the book), it has a lot of TOEFL lessons and exercises built for tackling each section of the TOEFL test. Here is a breakdown of all 28 lessons this book includes. There are 8 lessons in total. Each lesson covers one main TOEFL reading question type and contains additional reading exercises. There are 6 lessons in total. Each lesson concentrate on one main TOEFL listening question type. There is extensive practice for listening, taking notes, and answering questions. There are 6 lessons in total. Each of the six lessons focus on one of the six types of Speaking Tasks and provide exercises to help you plan and deliver responses. There are 8 lessons in total. The eight lessons guide you through the process of planning, writing, and editing two writing responses. If you want to study for the TOEFL by mastering individual test-prep skills instead of taking a lot of full TOEFL tests, this book might be right for you. Also, this book might be useful for you if have been studying for a while and need some more substantial practice to hone some specific TOEFL skills. However, be aware that there are no answers in the book, so you'll have to buy a separate answer book for that. Each section includes lessons with exercises, allowing you to make gradual improvements. For these four skills, Barron's might be the best skill-building book you can find. This book, however, does not include much vocabulary. Barron has another book specifically for TOEFL vocabulary called Barron Essential Words For The TOEFL. The quality of TOEFL practice questions in this book is great, but seems a bit different from what the real TOEFL test has. For example, some of the integrated writing questions ask you to summarize the reading, but the real TOEFL will ask you to summarize the lecture. In the listening section, the lectures are too complicated and the recordings don't have the pauses, uhhs, umms and repetitions a real TOEFL recording would have. Overall, this book has 7 full TOEFL practice tests. Despite the fact that their style and formatting don't adhere to the highest TOEFL standard, they are still great practicing for the TOEFL. The drills and lessons on note-taking, paraphrasing, summarizing, and synthesizing skills are amazing. We would recommend you have this book as an additional TOEFL study resource. If you plan on trying our online TOEFL preparation course, one question that gets asked a lot by our free trial users is "What is the best way to prepare for the TOEFL". And the answer we give every time is to use our 3 Step TOEFL Preparation Guide proposed at the start of this TOEFL practice test guide. What can I expect from your TOEFL Tests? Our TOEFL practice tests and TOEFL simulation tests are designed to make you feel like you are taking the official TOEFL exam. Questions including passages and audio lectures are close to the official TOEFL in terms of difficulty, length, and style. You'll gain confidence knowing what to expect on test day. You'll have access to 20 full-length 4.5 hour long TOEFL practice tests giving you estimates of where you stand compared to the actual TOEFL exam. You will also get grading and feedback on your speaking and writing responses. The TOEFL Simulation Tests are different from the TOEFL practice tests because the practice tests use recycled questions from our "TOEFL QUESTIONS" area, while the TOEFL simulation tests use new never before seen TOEFL questions. What that means is the simulation tests are designed to guarantee a complete TOEFL exam experience. This makes the simulation tests extremely useful in your TOEFL preparation. What is a TOEFL Sample Test? In order to use our TOEFL preparation 3 step study guide, you'll need access to high quality TOEFL practice tests, TOEFL lessons that can teach you specific skills for all TOEFL sections, TOEFL questions organized into a proper studying area for optimal skill improvement, and 1-on-1 speaking and writing reviews with detailed feedback, so you can learn from your mistakes. You can get all that right here at BestMyTest. You can check us out completely free of charge with zero commitment by signing up to our 7 day free trial. Prepare for the TOEFL with over 1000 TOEFL questions, 100 lessons, 20 TOEFL practice tests, speaking and writing reviews, and many more.